Turning to the man next to him he said, "I forgot my teeth." The man said, "No problem." He reached into his pocket and pulled out a pair of false teeth. The man then said, "I have another pair - try these." 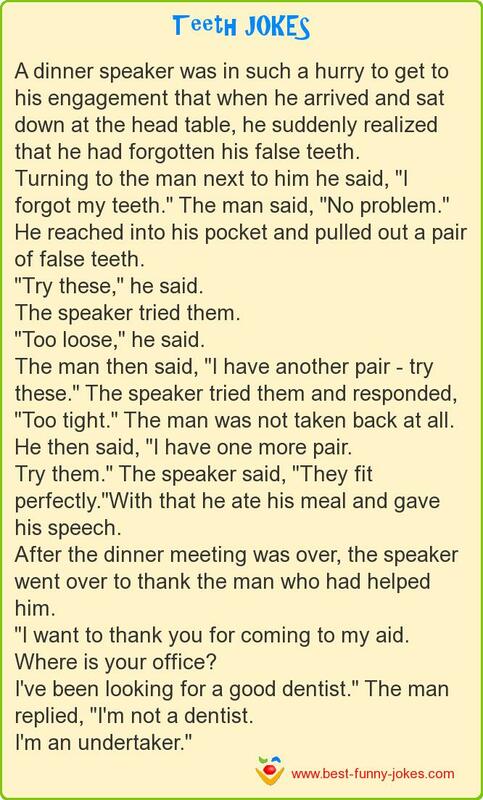 The speaker tried them and responded, "Too tight." The man was not taken back at all. He then said, "I have one more pair. Try them." The speaker said, "They fit perfectly. "With that he ate his meal and gave his speech. "I want to thank you for coming to my aid. I've been looking for a good dentist." The man replied, "I'm not a dentist.